TheFluke 1760 Three-Phase Power Quality Recorder is fully compliant to IEC 61000-4-30 Class-A, for advanced power quality analysis and consistent compliance testing. Designed for analysis of utility and industrial power distribution systems, in medium- and low-voltage networks, this power quality monitor provides the flexibility to customize thresholds, algorithms, and measurement selections. The 1760 power recorder captures the most comprehensive details on user-selected parameters. Event list Dips, swells and interruptions are detected and stored in the event list. Also any trigger which fires generates an event added to this list. Triggered recordings rms Aggregation time is adjustable between 10 ms (1/2 cycle), 20 ms (1 cycle), 200ms (10/12 cycles) or 3 sec (150/180 cycles). Online mode Variable refresh rate. This feature allows verification of instrument set up and delivers a quick overview of oscilloscope, transients and events. Battery pack In case of a power supply failure an internal battery maintains the supply for up to 40 minutes. Afterwards, or in case of discharged accumulators the Fluke 1760 is turned off and continues the measurements with the latest settings as soon as the supply voltage returns. The battery can be replaced by the user. 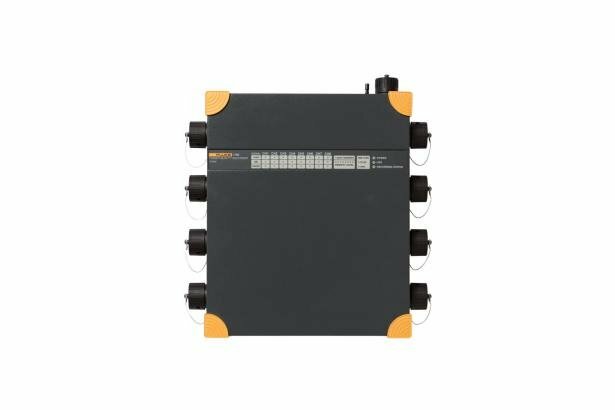 Display Fluke 1760 features LED indicators for the status of the 8 channels, phase sequence, power supply (mains or accumulator), memory usage, time synchronization, and data transfer. Permanent light: normal power supply from mains. OFF: supply via internal accumulator in case of a power failure. Sampling frequency for 50 Hz power frequency 10.24 kHz, The sampling rate is synchronized to mains frequency. Number of inputs 8 galvanically isolated inputs for voltage and current measurements. Input filter Each channel is equipped with a passive low-pass filter, an anti-aliasing filter and a 16-bit A/D converter. All channels are sampled synchronously with a common quartz-controlled clock pulse. Power Quality Monitor – Fluke’s three-phase power quality recorder is fully compliant to IEC 61000-4-30 Class-A and is consistent with compliance testing. The Fluke 1760 correlates multiple events, and provides undisputable verification in a Class-A compliant package designed for advanced power quality analysis.